Dishonored takes place in a city known as Dunwall, which is modeled after the Victorian era London. The game opens with the main character, Corvo, meeting with the empress to discuss a growing plague epidemic in the city. However, during their meeting, the empress is assassinated and her daughter is kidnapped, leaving Corvo unconscious. When he awakes he finds himself in a prison cell being tortured by the new ruling regime of Dunwall and is being prepped for execution, taking the fall for the empress’s death. But, as all good stories go, Corvo is able to escape and then embarks on a path of revenge against his captors with the help of people who remain loyal to the former empress and her daughter. 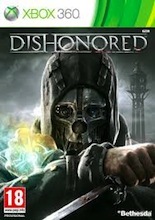 Dishonored is a stealth game played from a 1st person perspective. As such, there is a certain level of heightened anxiety that accompanies the game. The player must rely on all senses to keep an eye over his shoulder while also working to sneak through Dunwall successfully. The player also gains supernatural powers throughout the game, which allow him/her to teleport across short distances, possess small animals or humans, or even see through walls for incoming enemies. The final outcome of the game is dictated by a special “chaos” rating given at the end of every mission. Traveling unseen or using non lethal methods to dispatch foes leads to a low chaos rating while slicing and killing every person in the city will result in a high chaos rating. The most notable effect of either rating will be in the presence of zombie-like enemies. Low chaos will result in less zombies, high chaos in more zombies. Dishonored gives the player a great deal of choice with respect to the violence perpetrated in the game. If the player so chooses, they can get through the entire game without being seen by anyone and without killing anyone. (There are special achievements given if the player accomplishes either of these two scenarios.) However, if a player does choose to attack, he/she has many options. First, Corvo comes equipped with a sword which he uses to assassinate enemies or engage in sword to sword combat. If the sword isn’t effective, Corvo also has a pistol and a crossbow for ranged attacks as well as grenades for multiple kills. Lastly, to use his environment to his advantage, Corvo can possess creatures to sneak past guards and traps, or can even turn traps against his enemies. If the player does engage in combat and kills anyone, the 1st person perspective of the game gives a brutal close up of the death. Also, if the player chooses, Corvo can kill an enemy and have the enemy’s body dissolve into ashes. At times, significant amounts of blood will issue forth during kills and limbs can be severed. Along with the suggestive dialogue, there is some other sexual content to be aware of. First, during Corvo’s trip to the brothel, most of the female NPC’s are scantily clad. Also, during some downtime between missions, Corvo comes across a loyalist who is peeping on a servant girl who is taking a bath. After confronting the man, Corvo can walk right in on the woman and have a conversation with her while she is naked. No private parts are shown however. The primary spiritual content in Dishonored comes from the character known as “The Outsider.” He is a supernatural being who grants Corvo his powers of teleportation, possession, and “x-ray” vision. At various times, Corvo enters a trance where The Outsider speaks with him, though The Outsider has no other significant effect on how the game plays out. I did find Dishonored to be engaging, but only for a short time. After the first few missions, everything seemed to blur together and I simply ended up doing the same process with little variation. Normally I do not mind this, but in Dishonored, I became bored quickly. Certain aspects of the game, like the teleportation ability, were a fantastic addition, but overall, I was disappointed with the game.